The Cleopatra look in-stock synthetic lace wigs is from the synthetic Yaki wigs here at TCPG. 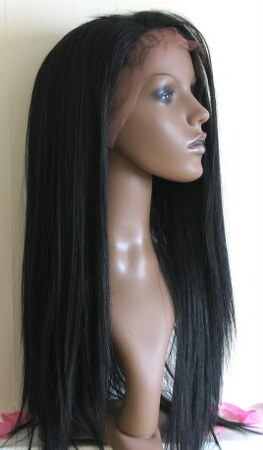 It’s a straight dark coloured wig with a light Yaki texture so suitable for those with extremely curly or afro hair. Being the light Yaki texture the hair is incredibly fluid and moves easily. Another easy to wear but elegant look is popular with first time wig wearers. Its 20 inch length means it’s a must have for those who are looking for length in their hair. You might think that with the length it would be a heavy wig, but in fact it's incredibly light and extremely easy to maintain. This is not a wig that likes to tangle! It's suitable for a range of face types... starting with the universal oval face shape. Off centre partings (which can be achieved due to the freestyle parting) and adding waves or curls will mean that those with rectangular/square faces can wear it to soften angles and round out the face. The front is made from quality Swiss/French lace with machine made wefts in the back - can be worn in a low ponytail. The lace is transparent, light brown, medium brown and dark brown - the model shown is medium brown. Free style partings mean that you can part it wherever you like. Circumference: 22.5” with stretch panels and an adjustable belt. The cap construction of these synthetic lace wigs mean they’re great for those who have growth hair as well as those who have lost all or some of their hair. This wig is light Yaki straight which resembles relaxed afro/extremly curly hair and the colour of this wig means it’s great for all skin ones. The colour shown is 1B which is an off black colour, but if you'd like it in any other colour including blondes and reds, contact us and we’ll arrange it for you.